This part was designed to be inserted with blow molded aluminum tank, no sharp edges and angles were allowed for this purpose. The blow molded part should be easily separable for recycling purposes and friendly to environment; unmolding agents were forbidden. An impact-modified non-reinforced Durethan PA was chosen for its heat- and chemical- resistance, as well as high MFI (melt flow index). This fastening lug part was injection molded on a 350-ton HaiTian press. The schedule was a tight one; our team built mold and produced parts within 5 weeks. KeSan achieved this mould within the planned finance and time budgets. 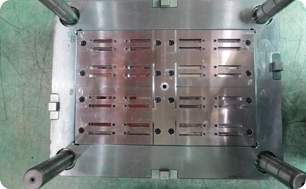 A 6 cavities family mold was built firstly, and parts were submitted to customer for functional and structural tests. Production tools featured in unscrewing mechanism, three-plate mold, and two-stage ejection. The tri-angle outer shape of two shells assembly made the screwing orientation difficult; KeSan achieved a perfection assembly for the two parts. KeSan was selected for the quality precision manufacturing capacity to supply precision cavity and core inserts and mold tooling. 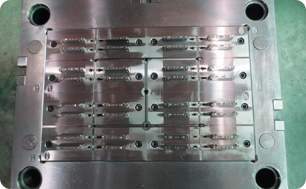 The general tolerance of the workpiece was +/-0.0004”, every small red copper electrode was vital for EDM machining by Agie Charmille and EROWA system taking VDI 3400/18#, for each piece should be interchangeable. Every workpiece was double inspected by our CMM machines before putting into use, which had greatly enhanced our work efficiency afterward. Kesan achieved this project by the strict quality management system. Our customer wanted to save cost on hot runner system, while keeping 32 cavities to meet a high production demands, every cavity was an individual insert for future maintenance and replacing work. A short cycle time was pursued by placing efficient and reasonable cooling system. The tool was designed with complete self de-gating, while PS plastics made the gate runner break easily before ejection, the gate scraps covered the impression. Our engineer solved this problem by adding ribs on gate ends, which could help gate stay with parts during ejection. A cold runner system was applied to replace the hot runner system. KeSan helped our customer reduce cost by 15% while building a functional mold.